Love the way it looks, but hate the way it feels? Facial beards have become all the rage lately, but many know not how to care for them. Much frustration and irritation has been had by both men and the women in their lives over scraggly, unkempt beards that don’t meet your expectations. That’s where this beard oil comes in. I use both Avocado Oil and Grapeseed Oil to get the best of both worlds for your skin and facial hair. Avocado Oil is known for its ability to penetrate deeply into the skin and hair follicle for excellent moisturizing and softening, whilst the Grapeseed Oil retains a light application and thus prevents clogging of the pores. The essential oil blend in this particular product has traditional roots. Inspired by the once ever-popular Bay Rum Aftershave, this blend of bay, orange, clove, and cinnamon harkens back to the days of European sailors in the 16th century. Exploring the Caribbean, the taste of Jamaican Rum gracing the taste buds of Westerners for the first time, and Bay Leaves of the West Indies proving their scent useful at masking the pungent odors of men at sea. In fact, in recent studies, these same bay leaves have been shown to both stimulate hair growth and actively prevent hair loss. Therefore, the Bay Essential Oil in this beard oil may assist you in growing a fuller, more impressive beard than you initially thought possible! (Of course, keep in mind, these claims are not backed by the FDA)! 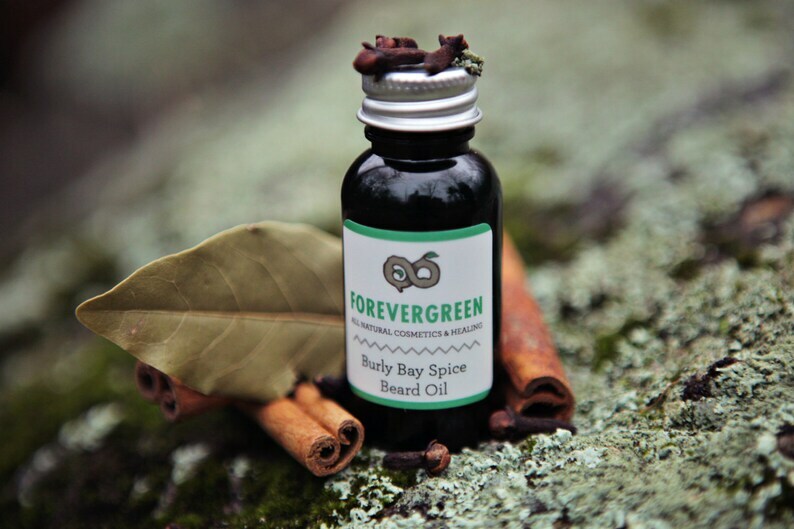 Each Burly Bay Spice Beard Oil comes in a 1 oz bottle with a restrictor. An application of only 2-3 drops (or more, depending on the length of your beard) is needed each night before bed to maintain a silky-smooth, impressive beard. Rest assured, that teeny little bottle should last you a good while. Also available in Striking Cedarwood - an earthy classic Atlas Cedarwood. I have been using this deodorant for the past two years and I am in love! Once you move past the slight inconvenience of having to scoop the product out from the container and apply with your finger, you realize it actually WORKS and keeps you dry and fresh without those toxic aluminum based ingredients. I love the smell, I love that the arrowroot powder keeps me dry, even on sweaty summer days, and I love love love that I never stink when I wear this. Not even a little bit, not even if I forget to reapply the next day. I sing the praises of this deodorant to anyone and everyone who will listen, and many of my friends and family have turned into ForeverGreen enthusiastic converts as a result!